Recently, in preparation for a trip to visit my daughter who lives in Holland, I was re-reading Philip Steadman's book Vermeer's Camera. 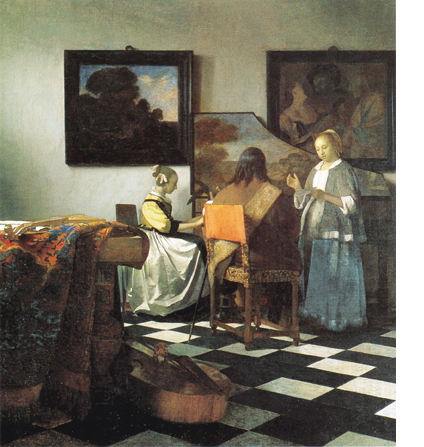 This book caused quite a stir when it was published in 2001 as, through a very thorough study of the paintings of Vermeer, Professor Steadman showed quite clearly that the extraordinary visual reality achieved by Vermeer was created via optical means. In other words, Vermeer used a camera obscura. Steadman used the laws of perspective to project sight lines back to find each painting's viewpoint. 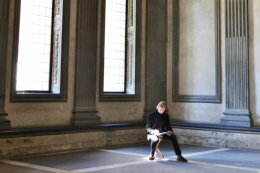 What he discovered is that there is a coherent space depicted in each painting - as there is in a photograph. Luckily Vermeer often has the far wall in his composition parallel to the picture plane, and sometimes there is a map or painting shown hanging on the wall. As, in some cases, these maps or paintings exist in the real world, and therefore their dimensions are known, this means that the size of everything else that Vermeer depicts can be worked out. The marble tiled floor shown in nine of the paintings acts as a sort of scale of measurement. 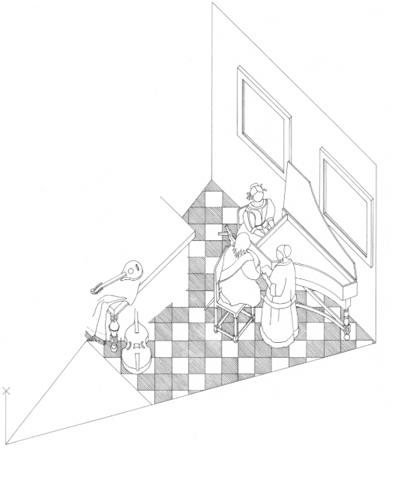 Philip Steadman has made axonometric drawings of the space depicted in each of the paintings which have a tiled floor; his drawing for The Concert (left) is shown below. All the other drawings can be seen at his website : www.vermeerscamera.co.uk along with a scale model of Vermeer's room. My Mornings in Florence project, which originally set out to see what can be learned about Brunelleschi's sense of 'good' proportion by measuring some of his buildings, led me to start thinking of systems of measurement in use before the adoption of the metric system. All the works of the Italian Renaissance were set out not in metres but in braccia. Reading Vermeer's Camera again I registered at once a sudden jolt when I came to the point when Steadman gives the size he has worked out for the tiles in the paintings as 29.3cm. I realised this is pretty much exactly half a braccio (29.18cm). So this led me to think - where does marble come from - Italy. Delft tiles are ceramic, therefore Vermeer's tiles were probably imported, and if they came from Tuscany then it makes sense that a useful standard size could be half a braccio. This could be additional confirmation that Steadman's findings are accurate. This then leads on to the problem that in the Vermeer paintings with marble floors, the grid layout is always the same (diagonal) but the pattern of black and white tiles varies. I have suggested that possibly Vermeer could have bought a stock of marble tiles and laid them out on the floor in these varying patterns as he was composing each painting. I think Vermeer was a compositional collagist; I think he would have done this, after all several of his props - chairs, jugs, maps, etc. - appear in different paintings. Earlier this year, when I was back on my Mornings in Florence project I was given permission to make measured drawings in Michelangelo's New Sacristy. 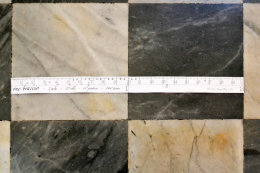 I was not really thinking of the tiles at this point, but accidentally dropped one of my paper braccio rulers onto the marble tiled floor (photos above). I lined the ruler up with the tiles and realised - of course - each tile is exactly half a braccio square. 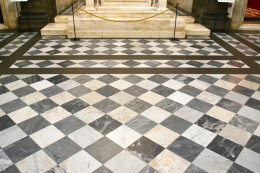 Therefore the idea that this was a common size for marble tiles in pre-metric Italy appears to be correct. How extremely interesting about the dimensions of the tiles! I didn't know this. I guess the Dutch would have imported their marble tiles from Italy... Clearly the half braccio is the standard size for Florentine marble tiles. And as you say, it is clear Vermeer used actual examples. If his tiles were imaginary he would hardly have struck on this specific measurement by chance...I think it’s quite plausible that he had a stock of loose marble tiles that he rearranged. That would be very much in character. Vermeer's The Concert (above) is notorious for being stolen from the Isabella Stewart Gardner Museum in Boston, USA, in 1990. Currently it is still unrecovered, and is usually thought of as the most valuable stolen painting in the world.